In the 1950's a renewed effort was made to promote the resort image of the Park. This effort centered around the Adirondack Inn. 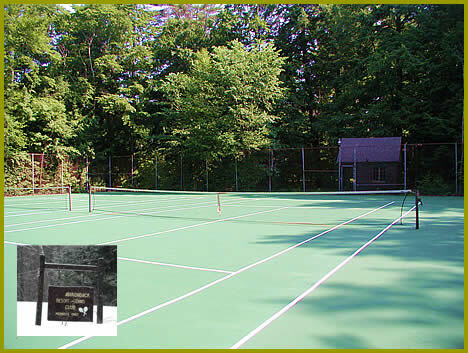 Three tennis courts were built in the area between the Adirondack Inn Annex and what is now the Village residential area. The location is right across from the Station. Unfortunately, the tennis resort concept did not become a success.Then the Inn burned down in 1975 and the Annex became an apartment house. The Sacandaga Tennis Club now maintains the courts. The courts are in a very pretty and serene setting and were renovated in 2006. The Club is looking for new members to join. You do not need to live in Sacandaga Park to be a member. Season guest privileges can be purchased by contacting the club.